This photograph breaks my heart. Washington, DC used to have so much character. 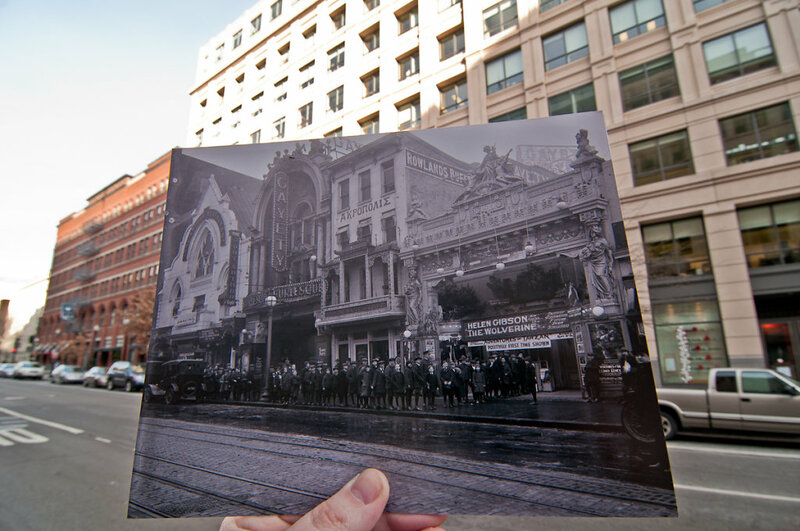 But we don't have anything like the set of buildings in this original photograph anymore. And, what's more, we never will again. And I missed it! This project is the only way I can ever see the way Washington, DC used to look, back when you could build four incredible buildings like these next to each other. It makes me very sad. I want to step into this photograph and go join those folks in line. I want to eat at the Acropolis Cafe. I want to visit the Gayety. And yet, the only thing left from this scene is the red brick building on the left. You cannot convince me that Washington, DC is better off by having the modern blahbuilding taking up this space instead.